Story of two families who's lives are intertwined, when the father of one family kills the son of the other in a hit-and-run accident. 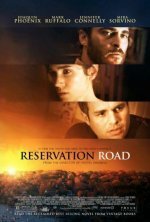 Reservation Road release date was Friday, October 19, 2007. A tale of anger, revenge, and great courage, the film follows two fathers as their families and lives converge. On a warm September evening, college professor Ethan Learner, his wife Grace, and their daughter Emma are attending a recital. Their 10-year-old son Josh is playing cello--beautifully, as usual. His younger sister looks up to him, and his parents are proud of their son. On the way home, they all stop at a gas station on Reservation Road. There, in one terrible instant, he is taken from them forever. On a warm September evening, law associate Dwight Arno and his 11-year-old son Lucas are attending a baseball game. Their favorite team, the Red Sox, is playing--and, hopefully, heading for the World Series. Dwight cherishes his time spent with Lucas. Driving his son back to his ex-wife, Lucas' mother Ruth Wheldon, Dwight heads towards his fateful encounter at Reservation Road. The accident happens so fast that Lucas is all but unaware, while Ethan--the only witness--is all too aware, as a panicked Dwight speeds away. The police are called, and an investigation begins. Haunted by the tragedy, both fathers react in unexpected ways, as do Grace and Emma. As a reckoning looms, the two fathers are forced to make the hardest choices of their lives.